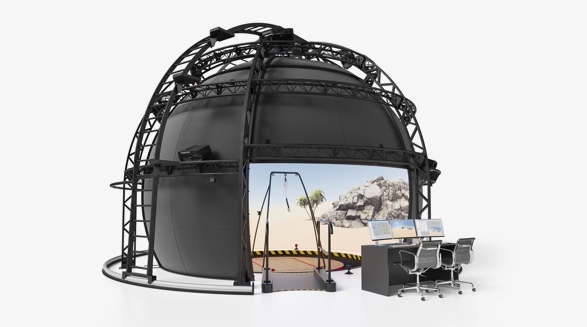 The Computer Assisted Rehabilitation Environment (CAREN) is the world’s most advanced biomechanics lab, and is being used by some of the best clinical and research facilities such as the Brain and Spinal Injury Centre (BASIC) and the state-of-the-art Defence and National Rehabilitation Centre (DNRC). View the latest videos taken at the CAREN training sessions at the DNRC here. 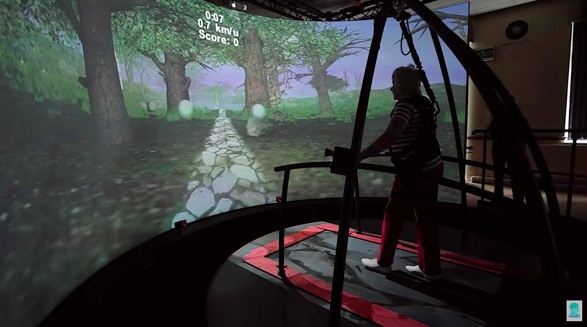 Developed by Motek, the CAREN is a versatile, multi-sensory system used for clinical analysis, rehabilitation, evaluation and training of human movement, balance and gait. The CAREN combines a motion platform with six degrees of freedom, an instrumented dual belt treadmill, motion capture, high speed video, D-Flow software, virtual reality (VR) and surround sound, and uses game elements and immersive interactions to engage the subject within a real time feedback loop. The CAREN can be used in many different types of research and clinical rehabilitation, ranging from neurological and musculoskeletal disorders, amputees, brain and spinal injuries, multiple sclerosis, Parkinson’s disease, military veterans, and return-to-sport rehabilitation. This features a dual-belt instrumented treadmill which is mounted on the motion base. 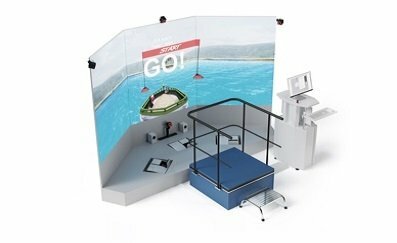 There is also a cylindrical virtual reality projection screen which allows wider peripheral vision scope of up to 180 degrees. This is bespoke for balance and all gait applications. 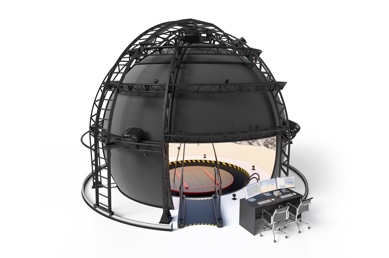 This model is the most advanced set up, featuring a 360 degrees dome for a fully-immersive virtual reality experience and a dual belt mounted instrumented treadmill. Again, this is bespoke for all balance and gait applications. Every CAREN can be upgraded in terms of kinetic and kinematic add-ons, wireless EMG, tailored motion capture suits, data gloves, head mounted systems, haptic systems, heart rate measurement systems, energy consumption systems, pressure measurement systems, and other device integrations using the D-Flow software. For research and clinical uses. These products are a clinical solution for assessment and training of impaired balance and stability. Both use virtual reality, and the DynSTABLE features a force plate within a moving platform. 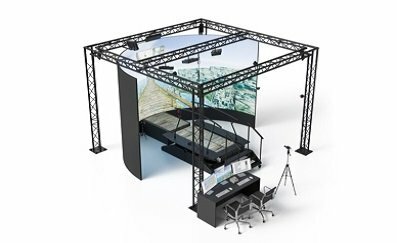 The GRAIL (Gait Realtime Analysis Interactive Lab) is a complete solution for gait analysis on 25m², and training in challenging conditions on a dual-belt instrumented treadmill with fast pitch and sway. The HapticMaster VR is a haptic robot designed to give users a realistic sense of touch in a virtual or remote world using their upper extremities. 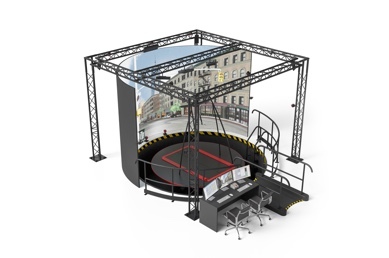 The M-Gait is a modular 3D instrumented dual-belt treadmill, which can have various upgrades to enhance your set-up such as pitch and sway, motion capture, bodyweight support and virtual reality. 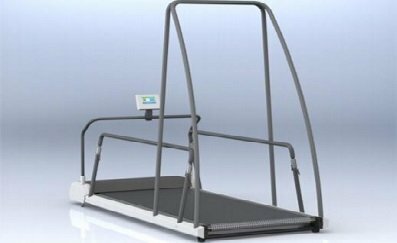 Smaller than the C-Mill (now distributed by Hocoma), the N-Mill is a single belt treadmill with an optional force plate. 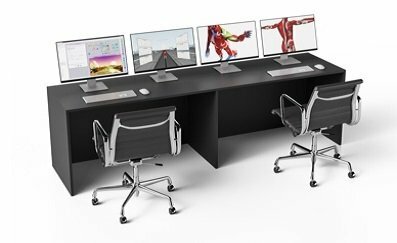 Including D-Flow, a control software suite which provides real-time data streams and users can easily create their own applications, and The Human Body Model for visualisations of muscle forces of the subject’s body on-screen. 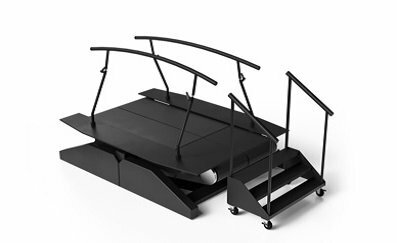 The RYSEN is the next generation of 3D body weight support systems, assisting patients in an all-directional, assist as-needed capacity to improve movement function.